Our flag is beautiful, and it reflects the bright, cheery, whimsical, outdoor-loving people it represents. 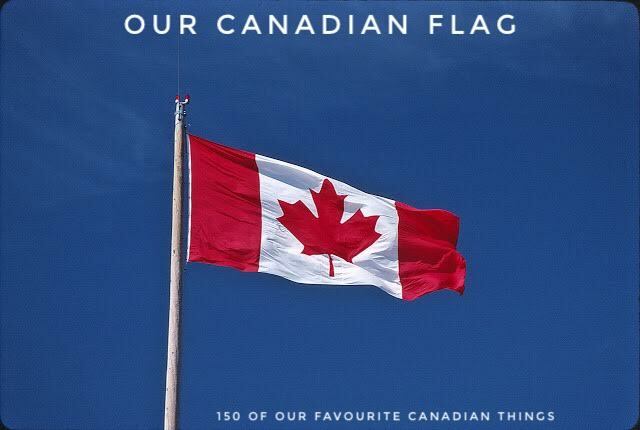 In flag-speak, the flag features a red field with a white square at its centre in the ratio of 1:2:1, in the middle of which is featured a stylized, red, 11-pointed maple leaf charged in the centre. In lay speak, it’s the maple leaf, l'Unifolié (French for "the one-leafed"), used for the first time on a country's national flag and, best put by the Honourable Maurice Bourget, Speaker of the Senate when the flag was unveiled, a "symbol of the nation's unity, for it, beyond any doubt, represents all the citizens of Canada without distinction of race, language, belief or opinion." The flag of Canada was officially adopted on February 15, 1965. It replaced a traditional flag that screamed of colonialism and staunch British conservatism, bearing the Union Jack and the shield of the royal arms of Canada. Canadians love their flag for its lack of pomp. It is something positive, something that can be proudly and happily tattooed on a shoulder or sewn onto a backpack. It declines the militaristic and severe attributes of other flags in exchange for something bright, proud, natural and simple. It is, truly, an accurate depiction of our nation’s character.